← A swimming pool can be the fountain of youth! Filter Your Swimming Pool With Recycled Glass Instead of Sand? Filtration systems use a variety of different methods to keep swimming pools clean. There is the classic sand filter, a cartridge filter, and the D.E. filters. But there are ways to update the classics! Check out VitroClean. 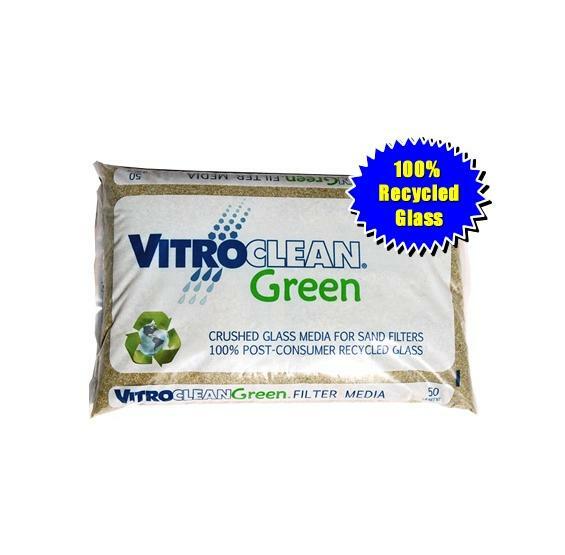 VitroClean, made from 100% recycled glass, is designed to replace grains of sand as the filtration media in a standard sand filter system. The glass is crushed, heated, and dried to form grains of glass with angular shapes and a high degree of sphericity. This allows the filter beds to have more open packing, so there is greater surface area of the media actually filtering the pool water. The glass media also has the advantage over sand because of how smooth it is—i.e. no grain boundaries—so bacteria is less resistant to flushing during backwashing. The glass also has a slight negative charge which improves its ability to “hold” fine particles throughout the filtration cycle. If you’re a pool or spa owner interested in a “green” alternative to sand for your sand pool filter, consider VitroClean. It can even be used to improve the performance of your current stock of sand by mixing the two together. This entry was posted in chemicals, Eco Friendly, Natural Product, pool filter and tagged Alternative Filter Media, Eco-Friendly, Sand Pool Filter Alternative, VitroClean. Bookmark the permalink.